A typical middle class Hindu upbringing of a child of the past century necessarily included generous helpings of mythology and instructive tales in everyday lives. Television amply complemented the mandatory temple visits, the satsang kathas and the elaborate festivities one had to be engaged with alongside one’s elders. Naturally, the more creative ones would find several characters from mythology lurking in their minds as they stepped into adulthood, and found themselves unmistakably drawn to the numerous re-workings of the Mahabharata and the Ramayana, as well as those of Krishna leelas in both print and visual media. Gunjan Porwal professes to be an engineer by day and writer by night, who belongs to this tribe of young Indians fascinated by Indian epic tales. 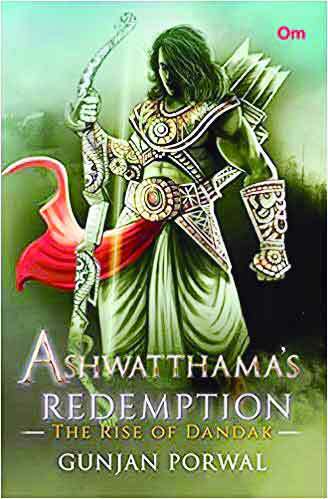 Ashwatthama’s Redemption: The Rise of Dandak is his debut novel of what promises to be an engaging series on giving a fresh lease of life to the much-maligned character of Ashwatthama. The tale, packaged between a captivating cover depicting a swashbuckling warrior of the age gone by, done in various tones of emerald green, is a pacy read. In twenty-four short chapters, Porwal weaves a thrilling tale winding through both the Mahabharata and the Ramayana, his professed twin inspirations. His brief author’s note invokes the prominent paragons of martial prowess in the Mahabharata like Arjuna, Karna, Abhimanyu and laments the lack of space and honour to the valiant son of Dronacharya, Ashwatthama. Emphasising Ashwatthama’s demi-god status of being part-incarnation of Lord Shiva, and one of the most powerful warriors, Porwal tries to make a case for how and why, despite being cursed into eternal, death-less damnation by Krishna, Ashwatthama deserves “redemption” through second chances. The story picks up from the time of a hundred years after the Kurukshetra War, where the scion of the state of Avanti, Rana is haunted by ill omens and strange visions. He is an unconventional prince himself with a troubled past and burns constantly with the desire to prove himself to his father, the king. He is joined by a fellow king, Vikram and together with Ashwatthama, and an unlikely woman companion, a beautiful and intelligent princess of Indraprastha named Urmila, they embark upon a quest to retrieve an ancient, but supremely powerful weapon from the treacherous Himavant ranges, to prevent the rise of one of the deadliest of asuras or demons, Dandak. The narrative intertwines the Mahabharata landscape with the possible threats from the Ramayana narrative: The heroes here belong to the Mahabharata, while the villains and the solution is delivered from the Ramayana. All the usual elements of an Arthurian quest are in place: There is a threat that needs to be addressed, there is a hero who needs to fight his inner demons and realise the true meaning of his life and his potential, there is a treasure/magic to be found through a perilous journey, there is an ancient code to be broken en route the quest to change the game, there are visions, ambushes and unlikely allies, help is found when there is no hope, there is bloodshed and there are fights, there is treachery and connivance, there is victory and defeat, and of course, a sweet, bubbling romance encased within all of this. The explanations provided for Ashwatthama’s fate are several and many also seem logical. His constant struggle to keep his sanity and regain strength is appealing. The connected stories of Janmejaya, Abhimanyu, Jayadrath, Ghatotkacha, Barbarik and Lord Krishna would surely add more layers to the story for those unfamiliar with them, but at times, some of the retelling lacks the nuance and depth to make it more realistic. The reins of the story stay firmly in Porwal’s hands throughout, which is a good thing for a debut novel. The psychological struggles of the lead character is also handled with a degree of sensitivity, without making it melodramatic or sensational. There is a constant reference to the “master plan” or cosmic plan, cutting across all yugas, the one where every being is factored in with a definite purpose. However, the urban reader cannot help but spot “inspirations” drawn from Avatar: The Last Airbender series that drew upon East Asian Art and Mythology (here, Guru Apasmitra can bend water), and other popular quest ventures like The Hobbit by JRR Tolkein (the hazardous travel in the snow clad mountains) to name a few. The Yetis too require better delineation in terms of their construction and function in furthering the story. The chapter titles are interesting (The Recluse, The Accidental Traveller etc.) and contain the flow of the narrative effectively from becoming too long. There are a few minor hiccups on the language front, uniformity of registers for a story set in the bygone era is a tricky facet, but equally crucial for the larger framework to work cohesively. The romance narrowly borders on being cheesy, though dealt with a great degree of restraint and suggestiveness. The end of this novel is unforeseen and comes too quickly, requiring greater attention in terms of defining the plot and a sustained build-up to it which again is a hallmark of a quest-mythological-thriller to be effective. Considering all aspects, Ashwatthama’s Redemption is a promising series, and The Rise of Dandak is a thought-provoking, quick read for those who enjoy mythologies and thrillers.